Wikimedia Commons has media related to Visitor attractions in Moscow. Pages in category "Tourist attractions in Moscow"
Blachernitissa, called Theotokos of Blachernae or Our Lady of Blachernae, is a 7th-century encaustic icon representing the Most Holy Theotokos and Ever-Virgin Mary. It is the given to the Church built in honour of the Virgin Mary in the Blachernae section of Constantinople. Blachernitissa is unusual among Orthodox icons in that it is not flat, according to Sacred Tradition, the icon Blachernitissa was made of wax combined with the ashes of Christian martyrs who had been killed in the 6th century. The Church of St. Mary of Blachernae was sited close to the Blachernae imperial palace, the Theotokos intercession, asked through veneration and prayer before the icon, was credited with saving Constantinople from the Persians during the reign of Heraclius and from the Arabs. These miracles are commemorated annually in the Orthodox Church on the Saturday of the Akathist on the Fifth Saturday of Great Lent, like many holy objects of Byzantine tradition, the Blachernitissa resurfaced on Mount Athos in the mid-17th century. It has been suggested that the Athonite icon had its origins in the Blachernae quarter and it was in 1653 that the icon was sent by the Athonite monks to Moscow as their gift to Tsar Alexis. A Constantinople merchant, Demetrios Costinari, brought it to Moscow on October 16,1653 and he was met by the Tsar in person, and Alexis had the icon enshrined in Moscows main church, the Dormition Cathedral, opposite Russias protectress, the Theotokos of Vladimir. This event is celebrated annually in the Russian Orthodox Church on July 7, paul of Aleppo, who accompanied the Patriarch of Antioch to Moscow in early 1655, was impressed by the reverence in which the icon was held. According to his account, the Blachernitissa appears as if she had a form and it stands out against the background so strongly. It was encased in a sumptuous chasuble glittering with gold and precious stones, so only the hands. Paul proceeds to describe how the Tsar had it placed in front of his own seat in a sledge, the Syrian clergyman, tells a different story about the icons provenance than that adopted by the Russian Orthodox Church. It was a Constantinople widow who discovered the icon in her house, the 1650s were a time when the Russian Church, steered by Patriarch Nikon, began to place great store on renewing its ties with the older members of the Pentarchy. This emphasis dovetailed neatly with the prevailing Third Rome doctrine which saw Moscow as the successor to Constantinople, with this in mind, the metochion sent the newly recovered Byzantine relic to Moscow and was handsomely remunerated with 800 dinars from the Tsars coffers. When placed in the Kremlin, the icon was in disrepair from old age and use, so that Simon Ushakov, the carved high relief icon has similarities to a set of 13th-century icons of St. George from the Crimea and Castoria. An original Greek inscription recently discovered under the coat of wax paints has a parallel in a seal from a Trapezunt monastery. Thus the 13th century seems to be emerging as the most likely date for the icon, following the Bolshevik Revolution the icon was removed from the Kremlin to the Vozdvizhenka Church of the Crosss Exultation. Lomonosov Moscow State University is a coeducational and public research university located in Moscow, Russia. It was founded on January 25,1755 by Mikhail Lomonosov, MSU was renamed after Lomonosov in 1940 and was known as Lomonosov University. It claims to house the tallest educational building in the world and it is rated among the universities with the best reputation in the world. Its current rector is Viktor Sadovnichiy, ivan Shuvalov and Mikhail Lomonosov promoted the idea of a university in Moscow, and Russian Empress Elizabeth decreed its establishment on January 251755. The first lectures were given on April 26th, russians still celebrate January 25th as Students Day. Saint Petersburg State University and Moscow State University engage in rivalry over the title of Russias oldest university. The present Moscow State University originally occupied the Principal Medicine Store on Red Square from 1755 to 1787, in the 18th century, the University had three departments, philosophy and law. A preparatory college was affiliated with the University until its abolition in 1812, in 1779, Mikhail Kheraskov founded a boarding school for noblemen which in 1830 became a gymnasium for the Russian nobility. The university press, run by Nikolay Novikov in the 1780s, published the most popular newspaper in Imperial Russia, in 1804, medical education split into clinical and obstetrics faculties. During 1884–1897, the Department of Medicine -- supported by donations. The campus, and medical education in general, were separated from the University in 1918, as of 2015, Devichye Pole was operated by the independent I. M. Sechenov First Moscow State Medical University and by various other state and private institutions. The roots of student unrest in the University reach deep into the nineteenth century, in 1905, a social-democratic organization emerged at the University and called for the overthrow of the Czarist government and the establishment of a republic in Russia. The imperial government repeatedly threatened to close the University, after the October Revolution of 1917, the institution began to admit the children of the proletariat and peasantry. The Orlov is a large diamond that is part of the collection of the Diamond Fund of the Moscow Kremlin. It is described as having the shape and proportions of half a chickens egg, the as yet unnamed stone passed from merchant to merchant, eventually appearing for sale in Amsterdam. Shaffrass, an Iranian millionaire who owned the diamond, found a buyer in Count Grigory Grigorievich Orlov. The Count paid a purported 400,000 Dutch florins and their affair continued as Grigory Orlov led the way in the dethronement of her husband in a coup détat and the elevation of Catherine to power. Their relationship carried on for years and produced an illegitimate child. Count Orlov sought to rekindle their romance by offering her the diamond, while he failed to regain her affections, Catherine did bestow many gifts upon Count Orlov, these gifts included the Marble Palace in St. Petersburg. Catherine named the diamond after the Count, and had her jeweller, C. N. Troitinski, now known as the Imperial Sceptre, it was completed in 1784. The Orlov is set at the top, with its domed top facing forward, above it is a double-headed eagle with the Arms of Russia enameled on its breast. The Orlov is a rarity among historic diamonds, for it retains its original Indian rose-style cut and its colour is widely stated as white with a faint bluish-green tinge. Data released by the Kremlin give the Orlovs measurements as 32 millimetres x 35 millimetres x 21 millimetres, the weight is just an estimate – it has not formally been weighed in many years. Lord Twinings book A History of the Crown Jewels of Europe mentions how once, during a circa 1913 inspection of the jewels by the curator. 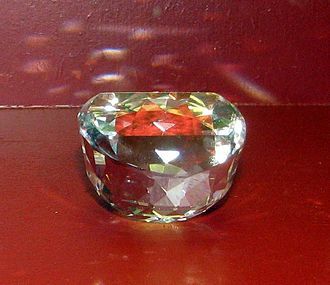 He weighed the stone, but did not write down its exact weight and he said that it was about 190 carats, which corresponds to the measurement-based estimate. Malecka, Did Orlov buy the Orlov, gems & Jewellery, The Gemmological Association of Great Britain, vol. Malecka, The Great Mughal and the Orlov, Famous Diamonds of the World, pp. 15–18. Gemological Institute of America, USA Twining, Lord Edward Francis, a History of the Crown Jewels of Europe, B. T.
The Memorial Museum of Cosmonautics is a museum in Moscow, dedicated to space exploration. It is located within the base of the Monument to the Conquerors of Space in the north-east of the city. The museum contains a variety of Soviet and Russian space-related exhibits and models which explore the history of flight, space exploration, space technology. According to the Russian tourist board, the collection holds approximately 85,000 different items, primarily from the Soviet period. Though the space monuments tower was erected in 1964, the museum did not exist for another seventeen years. Opening ceremonies took place on April 10,1981, to commemorate the 20th anniversary of the day Yuri Gagarin became the first human to orbit the Earth in space. The museum primarily focuses on the Soviet space program with major themes like Gagarin, Sergey Korolev, Sputnik, on Cosmonautics Day,2009, the museum was reopened after three years of reconstruction. It has virtually tripled its size and has added new sections dedicated to space programs worldwide, including the USA, China. The Hotel Metropol Moscow is a historical hotel in the center of Moscow, built in 1899–1907 in Art Nouveau style. It is notable as the largest extant Moscow hotel built before the Russian Revolution of 1917, in 1898, Savva Mamontov and Petersburg Insurance consolidated a large lot of land around the former Chelyshev Hotel. Mamontov and sponsor of Private Opera, intended to redevelop the area into a cultural center built around an opera hall. Mamontov eventually hired Kekushev as a construction manager, Savva Mamontov was jailed for fraud and the project was taken over by Petersburg Insurance, omitting the original plans for opera hall. In 1901, the topped-out shell burnt down and had to be rebuilt from scratch in reinforced concrete, the hotel was completed in 1907. However, it is nowhere near Walcots original design, a notable feature of Metropol is its lack of any reference to the orders of architecture. A structural mass shaped without reference to systems of support. Rectangular bulk of Metropol is self-sufficient, it needs no supporting columns, in 1918, the hotel was nationalized by Bolshevik administration, renamed Second House of Soviets and housed living quarters and offices of growing Soviet bureaucracy. Also known as the Moscow International House of Music, it is situated on the Kosmodamianskaya Embankment off the Garden Ring Road. The project won the Khrustalny Dedal architectural award at the XI All-Russian Zodchestvo festival, the first stone was laid on September 7,2000 by Spivakov and Moscow Mayor Yury Luzhkov. The Turkish firm Enka Insaat ve Sanayi A. S. constructed the centre, the centre cost US$200 million to construct, and was financed entirely by the City of Moscow. It was the first classical music hall constructed in the city in over a century and it is part of a business and hotel complex called Riverside Towers, intended by the City to be its equivalent of Lincoln Center. The centre has a concert hall similar to the Philharmonie in Berlin. Seating is laid out on two levels, and arranged in various tiers that almost surround the stage. The hall is on the third storey, with areas below. The auditorium seats 1,735, and is composed largely of Siberian larch wood, the centre houses a 575-seat chamber hall and a 532-seat theater. It has the largest organ in Russia, installed in Svetlanov hall in 2004, the organ was co-designed and built by the German firms of Glatter-Goetz and Johannes Klais. It has more than 5,500 pipes, ranging in size from 8 millimetres to 9.25 metres and it has 84 stops – three more than the second-largest Russian pipe organ, located at Moscows Tchaikovsky Concert Hall. The centre was originally conceived as a home for the Russian National Orchestra, at the end of the 2002–2003 concert season, the Russian National decided not to renew Spivakovs contract as principal conductor and musical director, and he abruptly resigned. Spivakov lobbied government officials to conduct a new orchestra in Moscow, the National Philharmonic Orchestra was formed under an executive order of Culture Minister Mikhail Shvydkoi, supported by President Vladimir Putin. Shortly after Spivakov became president of the Centre in May 2002, the Centre canceled the bookings for the Russian National, which rebooked some dates at higher fees and lost others. 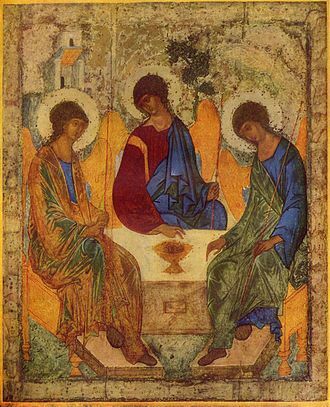 The Holy Trinity is an important subject of iconographic representation in Eastern Orthodox Christianity, and has a rather different treatment from depictions in the Western Churches. There are two different types of Holy Trinity icons, the Old Testament Trinity and the New Testament Trinity, though this is not its traditional title, this icon is sometimes called Old Testament Trinity because of its relationship to Genesis 18, 1-15. In Genesis 18, 1-15 three individuals appear to Abraham at the Oak of Mamre, the interpretation that this appearance is related to the Trinity is a Christian interpretation of the Hebrew scriptures. Consequently, the title of Old Testament Trinity is interpreting the Genesis narrative as much as it is naming the icon, from certain Christian theological perspectives calling this icon Old Testament Trinity is a form of Supersessionism. The New Testament Trinity depicts the Father, the Son and the Holy Spirit distinctly, Christ may be shown either as an adult, or as an infant sitting on his Fathers knees, which is the norm in early Greek depictions. The Father is painted as the Ancient of Days, a man with a very special type of nimbus. The Holy Spirit is shown as a dove with a halo of the same type as Father has. The dove may be placed between the Father and the Son, or the dove may be shown in a beam of light from the mouth of the Father and it is interesting that in Russian Orthodoxy, depictions of God the Father are prohibited. However, when the movement of antitrinitrarians became strong in medieval Novgorod, in this type of icon, Jesus Christ is depicted as an old white-haired man. The basis of this iconography is consubstantiality - the doctrine that Jesus, in the Western churches the Ancient of Days remains the basis and justification for depictions of God the Father, as made clear by, for example, a pronouncement by Pope Benedict XIV in 1745. The Second Council of Nicea in 787 confirmed that the depiction of Christ was allowed because he became man, the usual Orthodox representation of the Trinity was through the Old Testament Trinity of the three angels visiting Abraham - said in the text to be the Lord. However post-Byzantine representations similar to those in the West are not uncommon in the Greek world, and though David the prophet says, From the womb before the morning star have I begotten Thee, that birth was not fleshly, but unspeakable and incomprehensible. For Christ Himself says in the holy Gospel, No man hath seen the Father, and Isaiah the prophet says in his fortieth chapter, To whom have ye likened the Lord. And with what likeness have ye made a similitude of Him, has not the artificier of wood made an image, or the goldsmiths, having melted gold, gilt it over, and made it a similitude. And John Damascene says, But furthermore, who can make a similitude of the invisible, uncircumscribed and it is, uttermost insanity and impiety to give a form to the Godhead. In like manner St. Gregory the Dialogist prohibits this, for this reason, it is fitting on this occasion only to depict the Holy Spirit in the likeness of a dove. But in any other place those who have intelligence will not depict the Holy Spirit in the likeness of a dove, for on Mount Tabor, He appeared as a cloud and, at another time, in other ways. 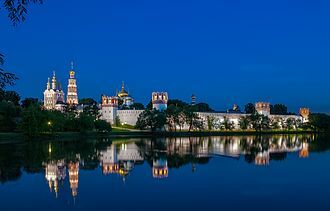 Novodevichy Convent, known as Bogoroditse-Smolensky Monastery, is probably the best-known cloister of Moscow. Its name, sometimes translated as the New Maidens Monastery, was devised to differ from an ancient maidens convent within the Moscow Kremlin, unlike other Moscow cloisters, it has remained virtually intact since the 17th century. In 2004, it was proclaimed a UNESCO World Heritage Site, the Convent is situated in the south-western part of the historic town of Moscow. The Convent territory is enclosed within walls and surrounded by a park, the park is limited by the urban fabric of the city on the north and east sides. 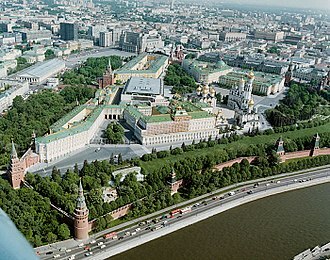 On the west side, it is limited by the Moscow River, the buildings are surrounded by a high masonry wall with 12 towers. The entrances are from the north and the south, the layout of the convent territory is an irregular rectangle stretching from the west to east. The oldest structure in the convent is the six-pillared five-domed Smolensky Cathedral and it is situated in the centre of the axes between the two entrance gates. Most scholars agree that the cathedral was rebuilt in the 1550s or 1560s and it was formerly ringed by four smaller chapels, in an arrangement reminiscent of the Annunciation Cathedral in the Kremlin. Its frescos are among the finest in Moscow, the cathedral may be a focal point of the convent, but there are many other churches. Most date from the 1680s, when the convent was renovated at the behest of the regent Sofia Alexeyevna. The blood-red walls and crown-towers, two lofty over-the-gates churches, a refectory, and residential quarters were all designed in the Muscovite Baroque style, in the old cathedral, a new bowl for holy water and gilded carved iconostasis were installed in 1685. Its four tiers contain 16th-century icons endowed by Boris Godunov, the fifth tier displays icons by leading 17th-century painters, Simeon Ushakov and Fyodor Zubov. An arresting slender belltower, commissioned by tsarevna Sofia, was built in six tiers to a height of 72 metres and this light octagonal column seems to unite all major elements of the ensemble into one harmonious whole. Iverskiye Gates leading to Red Square are the only extant gates of the Kitay-gorod wall. St. Nicholas Church on the Ilyinka (1680–89), with its gold-starred blue domes, once dominated Kitay-gorod's skyline. It was razed in 1933. Young Pioneers at Vladimir Lenin's Mausoleum, 1968. Tsarevna Sofia Alekseyevna at the Novodevichy Convent (1879), by Ilya Repin. The quadriga was sculpted by Peter Clodt von Jürgensburg. A. A. Bakhrushin state Central Theatre Museum.